Imagine cruising your way through either the Caribbean, Bahamas, or Mediterranean aboard one of the most luxurious, opulent, and grandeur are available on private yacht charter vacations on Lazy Z. 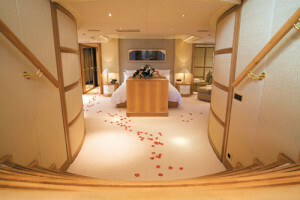 Though this luxury crewed yacht charter was launched back in 1997 by Oceanco Shipyard, it recently was refitted, making the use of 4 million dollars to include all new teak deck, paint, installation of stabilizers, full service of all mechanical, plumbing, and piping systems, and also a newly designed interior décor. With a reminiscent 2011 title ‘Yacht of the Year’ by This Water Sports, the private yacht Lazy Z is taking even more strides to make sure its guests are given the best in all aspects while aboard; starting with the first glance of its exterior. The sleek design on the outside lures you into wandering through its insides where innovative style meets effortless comfort. 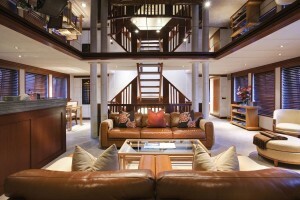 So, what exactly will you be experiencing when you do decide to rent a luxury yacht like that of Lazy Z? For starters, this all-inclusive yacht charter includes the Master Stateroom located on the main deck featuring a large California king bed, twin bathrooms, and a private lounge boasting impeccable 180-degree views. Continue down through to the other five guest rooms located on the lower deck where three king staterooms, one double suite with a Pullman berth, and another with twin beds await your other guests aboard. 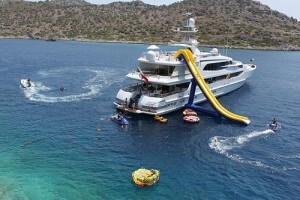 Not only will you enjoy your amenities while aboard the luxurious power yacht Lazy Z luxury crewed yacht charter like the ones mentioned above, you will also thoroughly enjoy the long list of water attractions available whenever you so feel desired to use them. Some of these include underwater scooters, wakeboards, knee boards, wake skates, slalom skis, wake surfers, beach tents, tow-ables, 2 VX Deluxe Yamaha jet skis, snorkeling and scuba diving gear, and SO much more! 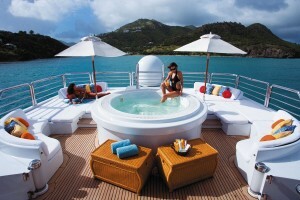 If you are worried about finding activities fill your days with while on this luxury crewed yacht charter, don’t be! The fun is truly endless and something that will make your experience on board all the more unforgettable. So, whether you want to charter this all inclusive yacht in order to explore the exotic lands of Greece, the Caribbean, Bahamas, or another undeniably beautiful place around the globe, give us a call today and we will tell you all about your options, including one question that is probably at the top of your list: how much does it cost to charter a yacht? We will be more than happy to answer any and all questions you have so that you can start planning the dream holiday you have always wanted aboard the impressive mega yacht Lazy Z. Kindly reach us on 800-478-2029 or for international callers dial +1 954-720-0475.